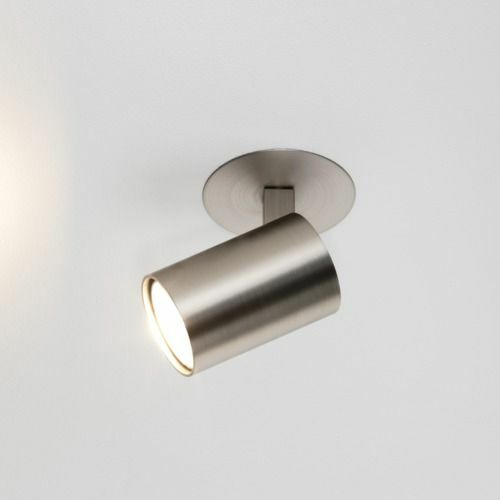 The Ascoli 6151 Matt Nickel Spotlight is suitable for indoors. It has a height of 128mm, a width of N/A, a depth of 21mm, & a diameter of 80mm. A Halogen product as standard, it requires 1 x 50W Max GU10. The Lumen output (brightness) of this product is dependent upon the bulb you use. The Ascoli 6151 is dimmable, dependent upon the lightbulb you use & the relevant dimmer switch is lamp dependent. This product doesn't have a switch, which means you would use a wall switch & an IP-rating of IP20, which means it can be installed in bathroom Zone 3. The 6151 is a class 1 product which means it requires an earth connection in your lighting circuit (normally a green & yellow wire). It is not a fire-rated product & no LED driver is required. The manufacturer suggests that this particular product should be mounted in to a plasterboard ceiling only & is not suitable for mounting into a solid ceiling. The 6151 has a recess depth of 30mm. The product also features a tilt adjustment angle of 90 degrees & a rotation adjustment angle of 330 degrees. Height = 128mm, Width = N/A, Depth = 21mm, Diameter = 80mm.